Wildflower Hill is at the top of my list for favourite books of the year and I would even say I consider it one of my favourite books of all time. It was absolutely wonderful. It’s the kind of the book that leaves a lasting impression. I finished it a couple weeks ago and I am still thinking about it. 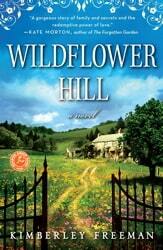 I think of one of the reasons why Wildflower Hill really touched me was the rich characters especially Beattie. I fell in love with her strength and kindness. I envied how she dealt so courageously with all the difficult situations life threw her in and she never once stopped to feel sorry for herself. This woman endured SO MUCH heartache that I was literally sobbing and even thinking back and imagining myself in the situation she was in, makes me misty eyed. This book brought out so many emotions in me and to me, that’s a sign of a good book. I love books that can make me feel for the characters and be in the moment with them rather than just reading and observing. I felt anger towards Beattie’s parents for abandoning her, and was furious with Beattie’s “husband” and his wife. I don’t want to give the story away so I want to be careful what I say. The story goes back and forth between the present day with Emma, the ballerina and back to the 1920s and 30s to her grandmother, Beattie’s time. It’s perfectly woven though so you don’t feel like its jumping back and forth. I think Kimberley Freeman did an amazing job intertwining the two generations and developing the family history that becomes so important to Emma in the present day. I also really enjoyed the scenes in the Tasmanian countryside. Wildflower Hill appears to be a breathtaking location and I was taken away with all the vivid description of the countryside. This book is a “must-read”. I’m going to read it again because I loved it that much. Wow! This sounds superb. Another book to add to my wish list. For some reason, I like sheep stations. What’s that about?? lol. Must read this one.